- DUAL USB PORTS - One 5V-2.1A USB charging port to get your phone full charged in short time, and the other is designed for reading USB files. 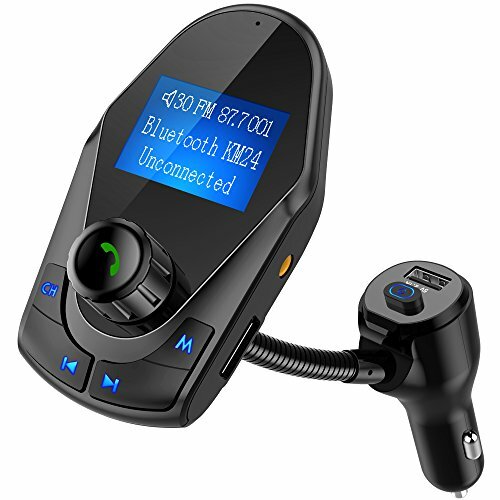 - SUPER WIDE COMPATIBILITY -This Nulaxy KM24 car FM transmitter works with most Bluetooth enabled devices, like iPhone, iPad, iPod, Tablet, Smartphones or MP3, MP4 Players via 3.5mm audio jack. - UPDATE WITH POWER ON/OFF BUTTON - This KM24 is upgraded with a manual switch, which you can use to turn off the device, and prevent some car battery from being drained out. - BIG DISPLAY SCREEN - Phone number for incoming calls & name of songs playing through TF Cards and USB flash driver could be displayed as well (songs via Bluetooth will not display).